The Linkin Park tour of North American will been canceled after their front man Chester Bennington took his life in mid-July. The 41-year-old singer’s body was found in LA; sources say that it was an apparent suicide by hanging. Live Nation said that The Linkin Park One More Light North American Tour was canceled and all tickets will be refunded. They added that they were saddened by the passing of the lead singer and their thoughts and prayers are with those affected. On the day of his death, the band released their music video for the song “Talking to Myself,” which features past tour footage. The Warner Bros Music CEO and Chairman Cameron Strang said that Chester Bennington was an extraordinary artist who had a big heart. He went on to say that his thoughts and prayers were with the band mates and his family affected by the tragedy. He added that the WBR family is in mourning with the millions of grieving fans around the world. The record company set up a tribute outside their headquarters to show their respects to the singer. 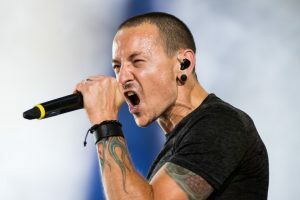 Chester left a wife Talinda Bennington, their son Tyler and twin daughters Lilly and Lila, and three other children from his previous relationships. Many die hard Linkin Park fans have visited his home in LA to pay their respects to the singer.